Cash, cheques or VISA accepted. Limited space available. This course has been presented over 950 times to more than 21,000 individuals. It is designed for managers, engineers, geologists, land men, scientists, accountants and other professionals concerned with measuring the economically equivalent value of investment opportunities. It addresses the economic analysis of income and service producing investment opportunities using discounted cash flow analysis procedures. 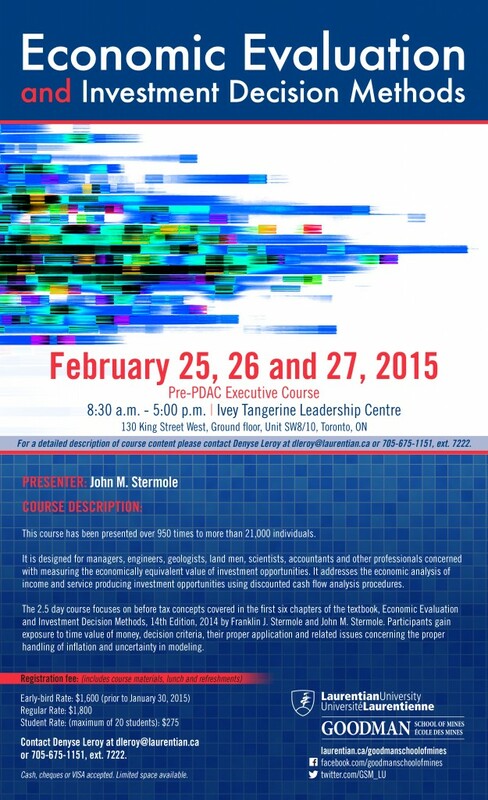 The 2.5 day course focuses on before tax concepts covered in the first six chapters of the textbook, Economic Evaluation and Investment Decision Methods, 14th Edition, 2014 by Franklin J. Stermole and John M. Stermole. Participants gain exposure to time value of money, decision criteria, their proper application and related issues concerning the proper handling of inflation and uncertainty in modeling. John M. Stermole, age 57, is President of Investment Evaluations Corporation. He received a B.S.B.A. in Finance from the University of Denver and an M.S. in Mineral Economics from the Colorado School of Mines. 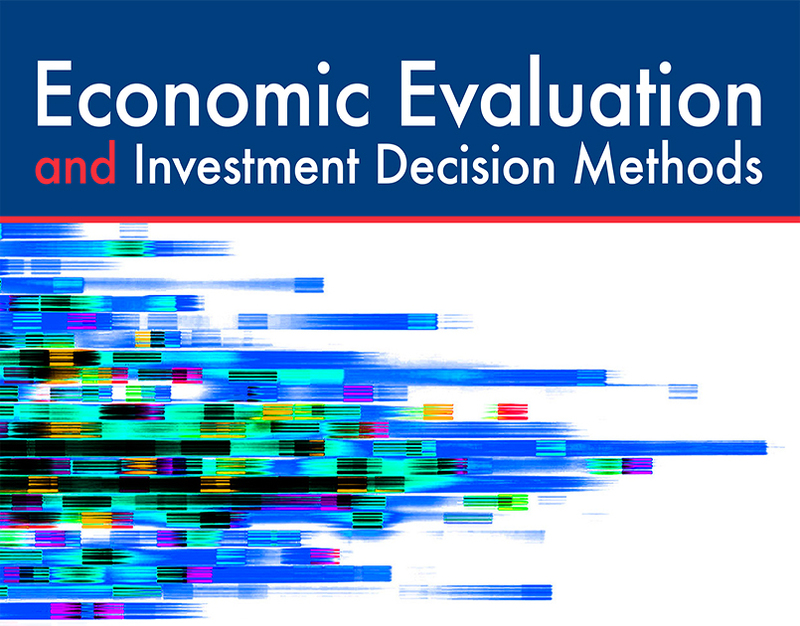 John is co-author of the textbook, “Economic Evaluation and Investment Decision Methods,” now in the 14th Edition. Since 1986, John has presented the course “Economic Evaluation and Investment Decision Methods” more than 500 times to the companies and government agencies and institutions. 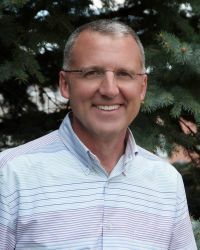 John Stermole is also a Teaching Associate Professor at Colorado School of Mines and teaches this subject for the Division of Economics and Business (Mineral Economics) and the Division of Chemical and Biological Engineering. http://inside.mines.edu/John-Stermole. John has taught at Mines since 1988. Courses in “Engineering Economics,” or “Economic Evaluation and Investment Decision Methods” are presented to junior, senior and graduate level students. From 1996 thru 2010 and again in 2012, CSM graduating Senior’s recognized Mr. Stermole as one of the “Outstanding Faculty Members” at Colorado School of Mines. In 1997 John was appointed as a Fellow to the Institute for Global Resources Policy and Management at the Colorado School of Mines where his work focused on modeling mining taxation sensitivity for over 20 countries. From 1998 through 2005 John also taught this subject matter as an Adjunct Professor at the University of Denver, Sturm College of Law, in their Natural Resource and Environmental Law Graduate Program. You will learn to apply the concepts of time value of money in calculating rate of return (internal rate of return), net present value, ratios and other criterion. 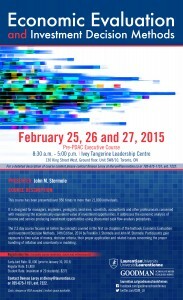 Other topics include understanding calculator and spreadsheet functions, graphical approaches illustrating the meaning of decision criteria and common methods used to determine an appropriate discount rate. Evaluating service producing alternatives will be presented including cost analysis and incremental calculations. The application of decision criteria to mutually exclusive and non-mutually exclusive alternatives will be reviewed. This discussion will also introduce related problems concerning cash flow streams, exhibiting a cost-income-cost pattern and the subsequent dual rates of return and the meaning of economic results. Application of inflation as it relates to escalated (or current) and constant (or real) dollar analyses will be introduced. Continued discussion on inflation will focus on understanding how this important parameter may impact the type of dollars and the appropriate discount rate in escalated and constant dollar calculations. Sensitivity analyses addressing uncertainty are explored along with an introduction to quantify risk through expected value calculations. The course is structured around an open discussion of examples followed by problem solving related to the example material. Students should bring paper, pencil and calculator to class each day. A financial calculator such as the HP10BII is ideal for class exercises. Smart phone apps are available for this model at very modest prices. Laptops with Excel represent and equally viable alternative for problem solving. Stay tuned for more information regarding a networking event.